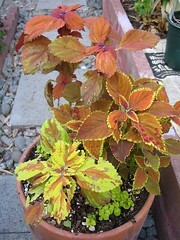 (Top, right center, bottom left) Coleus ‘Sedona’, Coleus ‘Rustic Orange’ and Coleus ‘Copper Splash’. Creeping Jenny growing underneath the Coleus. This entry was posted in Uncategorized and tagged coleus, coleus copper splash, coleus rustic orange, coleus sedona, lyssimachia nummularia aurea. Bookmark the permalink.